Zenith’s iconic PILOT CRONOMETRO TIPO CP-2 is treated to brand-new gear and an eminently useful function for 2018 as the brand with the guiding star revives its famous 1960s Cairelli model with the Pilot TIPO CP-2 FLYBACK. In a choice of bronze or aged stainless steel and with a range of stylish modifications, this subtly altered icon gains a trendy edge while losing nothing of its traditional adventurous DNA. In October 2016, Zenith presented its tribute to one of the most coveted military pieces, the HERITAGE CRONOMETRO TIPO CP-2, affectionately referred to by collectors as the ‘Cairelli’ watch. It belongs to the exclusive lineage of legendary chronographs that have earned the status of exceptional timepieces in both military and watchmaking history and is one of the historical treasures of the Manufacture in Le Locle. The original piece, a military chronograph created throughout a decade from the mid-1960s on, was commissioned by the Italian Army through the Italian dealership A. Cairelli in Rome. ‘CP’ stands for cronometro di polso (wrist chronometer). In recent years, the 2,500 units produced by Zenith in the 1960s for the Italian armed forces have fetched sky-high prices on the vintage market. Today, the brand with a star defies fleeting fashions and indeed time itself with the launch of its Pilot TIPO CP-2 FLYBACK. Now equipped with a cutting-edge automatic El Primero column-wheel chronograph with flyback function, this latest revival of the famous Cairelli model from the 60’s is designed for intrepid adventurers, both male and female. Offering a choice of a bronze or aged stainless steel case, the 2018 Pilot TIPO CP-2 FLYBACK exudes all its intrepid DNA and demanding technical specifications in terms of reliability, indications, readability, and robustness in every situation of its iconic predecessors, while subtly morphing into a highly desirable fashion accessory. Despite its undeniable appeal to fashion-conscious modern watch lovers, nothing is missing from the impressive range of assets offered by this historic chronograph: hands designed to ensure perfect readability even in tough conditions; bezel enabling reliable and accurate handling; easily accessible and responsive pushers… These signature characteristics testify to impeccable compliance with the drastic set of technical specifications imposed by the military. Transcending time, the 2018 PILOT CRONOMETRO TIPO CP-2 FLYBACK features the imposing 43mm stature of its illustrious predecessor, along with a high-precision movement, faceted arrow-shaped hands, Arabic numerals and a trademark TIPO CP-2 dial with running seconds and minute counters at 9 o’clock and 3 o’clock respectively. Bringing in change in 2018, however, the troops have been issued a new kit and the retro good looks of the 2018 PILOT CRONOMETRO TIPO CP-2 FLYBACK comes in two forms of dress. 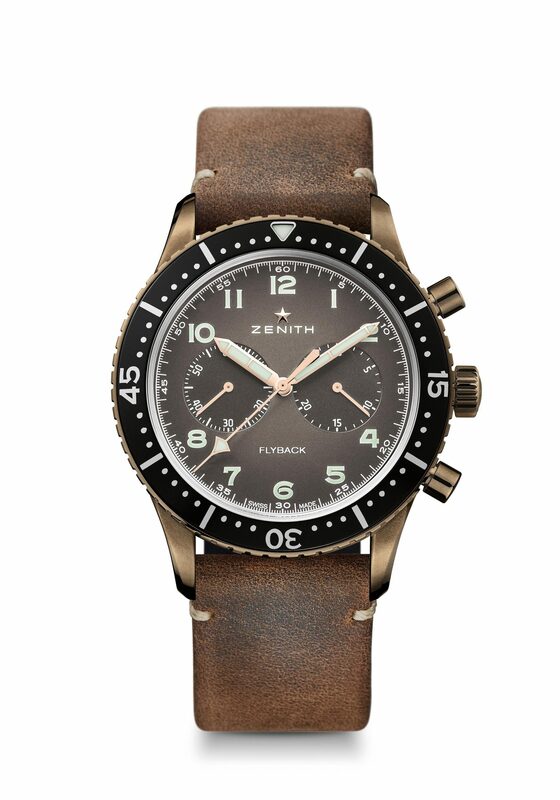 The first, echoing its aviation antecedents, is turned out in bronze with a matching bronze grained dial and brown oily nubuck leather strap with protective rubber lining. The second, in aged stainless steel, is designed to appeal to those with an affinity for the world of motorbikes, and sports a sober slate grey grained dial and green oily leather strap with protective rubber lining. Both straps are finished with a titanium pin buckle for total security, while the case backs have a transparent sapphire crystal enabling the owner to have a look at the beautiful El Primero mechanism.